Richmond, CA— Richmond Main Street Initiative (RMSI) is excited to bring their 10th annual Spirit & Soul Festival to Downtown Richmond this Saturday, September 15, from 1-5pm, on Macdonald Avenue from Harbour Way to 13th Street. The Festival marks the end of a phenomenally successful summer of events and programs that have brought record-breaking crowds Downtown to enjoy some the Bay Area’s premier musical talent with friends, family, and community. 2018 has also ushered in the start of projects that will transform Downtown Richmond into the urban village that residents have envisioned. With support from community, corporate and city partners, and private investment, the Richmond Business Hub will be opening soon, offering a co-working space, coffee shop, and food business. This will be the first development of this type in Downtown Richmond. At Saturday’s Spirit & Soul Festival, RMSI will salute some of our most celebrated soul artists. The Main Stage Salute to Soul lineup will showcase top Bay Area talent and some of our country’s most celebrated music artists: the headlining–and show stopping–1st Avenue Revue will pay tribute to the incomparable Prince, Ray McCoy is set to bring the satin smooth vocal magic of Luther Vandross, and But-tah Buttafly’s extra special homage to the Queen of Soul, Aretha Franklin, will have everyone dancing on Main Street. Richmond’s very own 2morrows June will open the show with their unique pop/rock stylings. Friend and community advocate, Antoine Davis (102.9 KBLX, morning show host) and comedian J-Red, will serve as the MCs for the Main Stage. Meanwhile on the 12th Street Stage–hosted by the Richmond Main Street Youth Committee–a performing arts extravaganza, featuring The Gaucho Dance Company, RPAL Music Program students, and other local talent, is sure to bring the Youth Zone to new levels of excitement and fun…along with free chess play, arts and crafts activities, Richmond Fire Engine (1:15-2:15), and an ice cream truck. In between the two stages, guests are invited to enjoy the festival’s outdoor marketplace featuring local food and artisan vendors offering an eclectic array of delicious food and unique items, and the beverage pavilion which will be pouring Main Street Margaritas, beer by East Brother Beer Company, wine, and refreshing kefir water tea courtesy of The Living Apothecary. This event is not to be missed! Food, music and fun for the entire family: Spirit & Soul Festival is FREE and open to the public. For those of who desire a just a bit more “pampering” organizers offer the VIP Experience – entry includes special reserved seating, 2 drink vouchers, 5 complimentary drawing prize tickets, a commemorative event program, and table service, plus primo views of the main stage! Located adjacent to Beverage Pavilion, near 1000 Macdonald Avenue, VIP Experience tickets are $20 in advance (and guarantees seating) or $25 at the door. Pre-sale tickets are limited and can be purchased online at Eventbrite.com. There is so much to celebrate in Downtown Richmond and RMSI has the perfect event for the community to participate in the renewal of Downtown: 10th annual Spirit & Soul Festival! 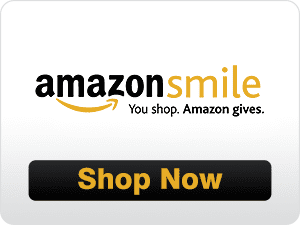 For more information, visit www.RichmondMainStreet.org or call (510) 236-4049. Spirit & Soul Festival is sponsored by Mechanics Bank, SF Bay Ferry, Sims Metal Management, The California Endowment, M.A. Hayes Co., Chevron Richmond, AC Transit, Ghilotti Bros., Republic Services, Cooperative Center Federal Credit Union, and City of Richmond, with generous support from SparkPoint Contra Costa, KBLX, and East Brother Beer Company. Additional support comes from volunteers and the Downtown Richmond Property and Business Improvement District (DRPBID). 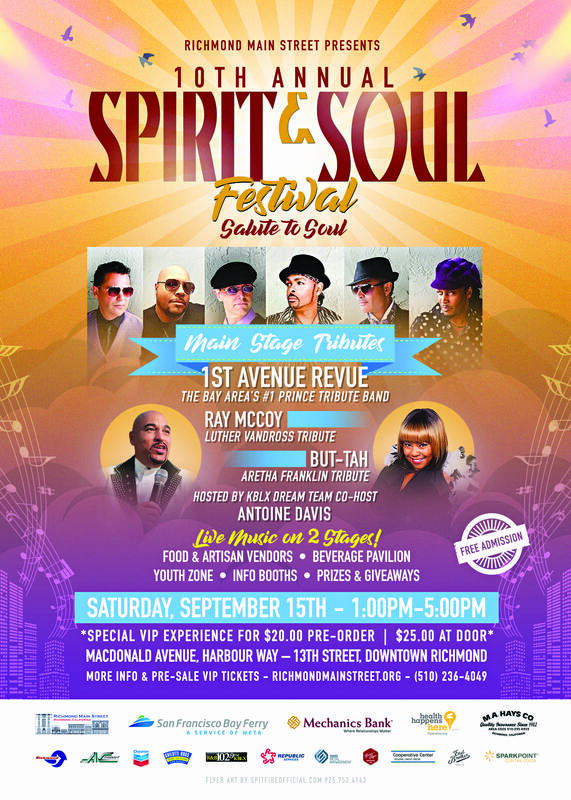 What: 10th annual Spirit & Soul Festival – FREE event!